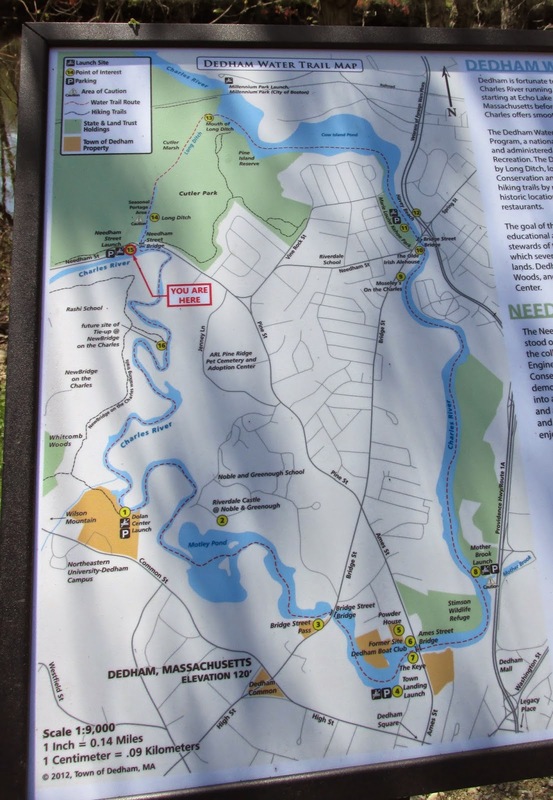 It was only recently that I learned of the Dedham Water Trail which allows the paddling of a very pleasant 6 mile loop of the Charles River. What made this loop possible was the 1653 digging by Puritan famers of a half-mile long ditch to divert a portion of the river's flow into a short-cut of sorts. I can't help but wonder if those Puritan farmers could ever, in their wildest imaginations, have pictured their ditch providing recreational paddlers a way to "close the loop" some 361 years later. ...I decided to go with the ditch's flow instead and do my route in a clockwise direction. Exiting from the other end brought me into Cow Island Pond and I began paddling upriver on the Charles from there, soon passing Riverdale Park (starting point for the 19-mile Run of the Charles event). This one marked the location of Havey Beach, across from Riverdale Park. This was another case where Puritan farmers in 1637 diverted a portion of the river. However, this time they sent some of the Charles to a tributary of the Neponset River. ...and the morning was a stellar one helping to erase memories of a too long winter. Continuing my upriver paddle through a winding and narrow stretch ultimately brought me back to my starting point at the Needham Street Launch. Enjoyed reading of your day on the Dedham Trail. Will do that one myself one of these days. Thank you for picking up trash in Dedham! I am a member of the Open Space Committee and spend a lot of time outdoors. I was searching my hard drive for a "good" photo of plastic trash to post on facebook to encourage people to vote YES on 2, but I couldn't find one (I guess I tend to delete them). So, I googled "plastic trash dedham" and found your blog. I've been sharing your blog and the photo of 30 pieces of plastic trash on facebook this morning. Thank you! - Stephanie Radner (http://dedhamnaturalwonders.org/ and Dedham Natural Wonders on facebook). You're welcome Stephanie. Glad to have provided a photo that might help in the Yes on Question 2 initiative. I've got my fingers crossed. Also glad to know of your Dedham Natural Wonders website.